Sport Pilot Examiners Jon Thornburgh and Matt Liknaitzky. Please feel free to browse the site for information related to getting your Sport Pilot certificate in Airplane, WSC trike and Glider. Special note: We now offer training to the Private level in WSC trike as well as examinations for Private Pilot WSC. 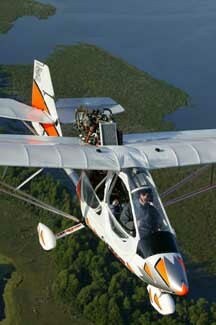 We also offer night training in WSC trike aircraft!